The 'Springhills' house is a small, cozy one-bedroom house, single-level, available for your exclusive use, comfortably accommodating 2 people. It is located 25 km from Whitehorse . 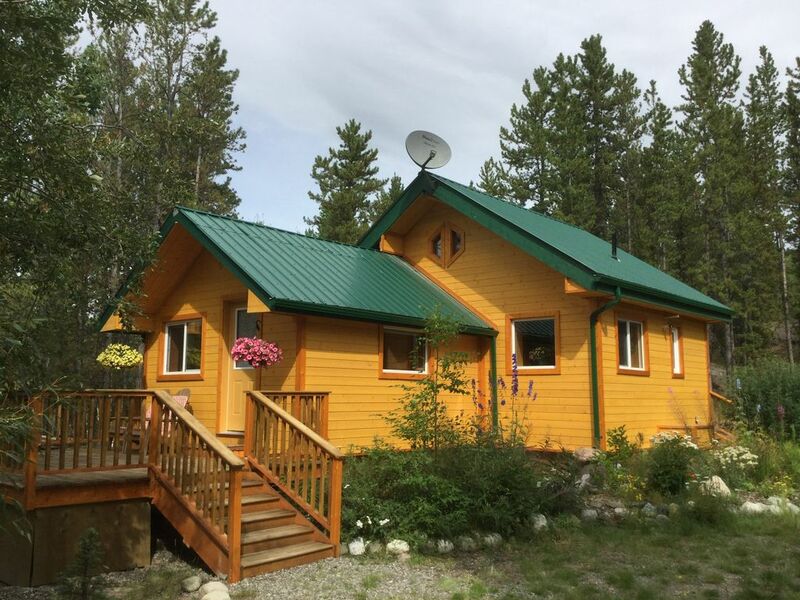 Enjoy the convenience, amenities and comfort of this little house as a base camp for your Yukon adventures or a tranquil retreat away from the busy-ness of your life. An extensive network of hiking, biking and ski trails begins at your doorstep. The place is ideal for watching the northern lights (aurora borealis) in the winter, either from the deck of the cabin or from a nearby hill with unrestricted views. You are next to the Takhini Hotsprings; receive discounted admission - you can walk there in your swim suit! The bedroom features a queen size bed with 2 duvets. The fully equipped kitchen opens into the comfy living/dining room where you'll find a couch and 44” Satellite TV. The house has lots of storage for your belongings and necessities. Above-standard insulation value and electric heat in each room provide you with a warm environment even in extremely cold winter conditions. There is no land line phone but cell phone coverage and complimentary high-speed internet (wifi), a desk, printer and device charging station for your business needs. Linens, towels, and basic pantry items are provided. For longer stays, extra towels and linens are available. We fell in love with the Yukon over 35 years ago and have made it our home since. We are still pretty busy working on projects but are enjoying this beautiful area next to the Hotsprings, spending a lot of time outdoors with our friendly dog Nya. We're looking forward to making your stay comfortable and memorable! The property is part of the Takhini Hotsprings resort lands. They are located in the traditional territory of the Ta'an Kwach'an First Nation. The area is popular with locals and travellers alike. The tranquility away from hustle and bustle drew us here and we love our solitary walks in the hills where deer and elk herds roam, and birds find refuge on their annual migrations. The opportunities for hiking and biking are many, on and beyond the resort trails. The house is new; it was built by us in 2015. My husband Gunter paid a lot of attention to detail and it shows - our guests enjoy that. "Everything you need" is in this warm and comfy little house. The magic of the northern lights will enchant you on cold winter nights. In summer, sit in the sun on the deck, watch and listen to the birds.... rest, relax and reconnect! Light a camp fire or stroll down to the hot pools for a soak. Walk over to the charming little Bean North - Cafe in the Woods for a treat, and organic, free-trade coffee roasted on-site. The Yukon Wildlife Preserve is a 20-minute walk can experience moose, muskoxen, mountain goats, Wood Bison, Mule Deer, caribou, elk, lynx, arctic foxes and different types of northern sheep. The property is part of the Takhini Hotsprings resort lands. The hot pools are a 3-minute walk away, 8.5 km nature trails on property, Cafe and wildlife viewing nearby. The property is located 25 km from Whitehorse in a country setting amid rolling hills. The house is secluded and private, the surroundings tranquil and peaceful, away from city lights and noises. The surroundings of the house afford beautiful views of mountains and the Takhini River valley. Electric heat in all areas. Ample parking at the house. Wifi. Inkjet printer is available. Bath and hand towels are provided, as well as face cloths. Free high-speed internet (wifi). No streaming or up/downloading large files allowed. Living room features 44" satellite TV, and extensive DVD library, as well as board and card games, small Yukon library and travel brochures. Drip coffee maker, filters and sugar. Basic items are provided, such as organic coffee, teas, sugar, spices, oil, vinegar, etc. Fully equipped but no dishwasher. Living/dining room is separate from bedroom. 44” flat screen connected to DVD player and satellite receiver. Small library of books on Yukon history and cultures. Collection of popular games for those 'stay-indoors' evenings. Extensive DVD library and player. Water craft can be rented in Whitehorse. Both the Yukon and Takhini Rivers are close for canoeing and kayaking. Deck chairs and table for outdoor lounging. Cross country ski trails are maintained in winter, ca. 7.5 km, starting 50 m from your house. Snowshoes are available for guests. 18-hole Mountainview Golf couse is about 20 km distant. Takhini Hotsprings are a 3-minute walk away. Please note that we do not provide transportation/shuttle services.